I am very comfortable with yeasted bread by now so making the dough was a breeze. The butter packet, on the other hand, used to make me frown. I do not like the mess of pounding and rolling out a block of butter to size. This is where the ingenuity of America’s Test Kitchen came in. If you look at the step-by-step photos, you notice that they shape pliable butter to exact measurement by using folded parchment paper. What a brilliant idea! I was a little skeptical by the unconventional way of enveloping the butter packet inside the dough. I really wasn’t sure the pinched seams could withstand the first rolling and still contain the butter inside. Luckily, it went okay. I have one little quibble though. Instead of spreading into a thin sheet, my butter broke into pieces instead. 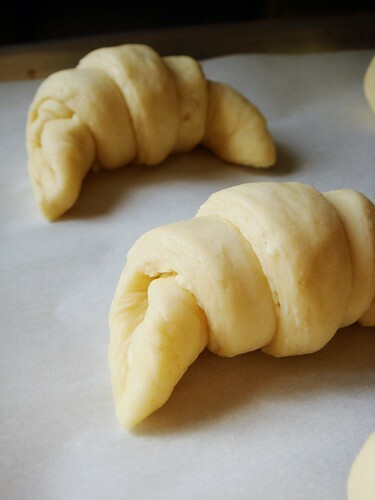 In theory, my croissant dough was not as flaky as it could be. In practice, I have no complaints. You can judge by the photos yourself. The turns and rolling out were free of drama. The dough behaved well thanks in part to the 30 minute chill in the freezer before each turn. Shaping the croissants was the fun part. I followed Dorie Greenspan’s tip of stuffing each triangle with an almond-size piece of scrap dough. 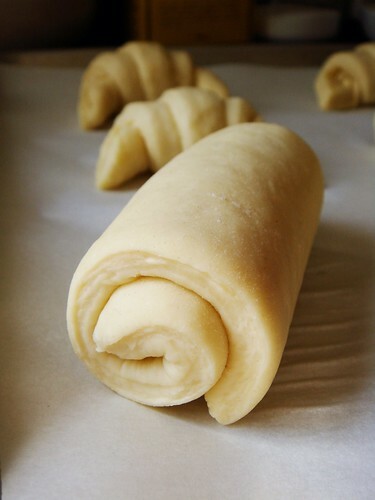 It was a lot of hard work to make croissant dough from scratch so I was super pleased that even the scraps were put to good use. 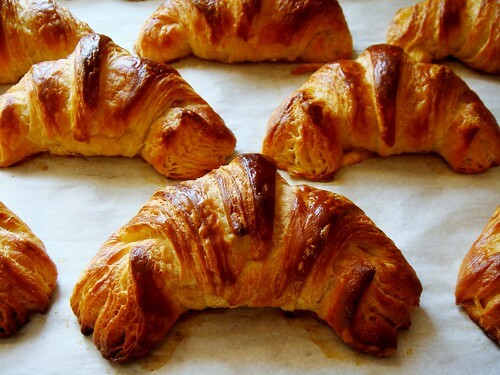 The stuffed croissants baked into beautiful crescents with full bellies. After a whole day of work, of course I could not stop at just croissants. 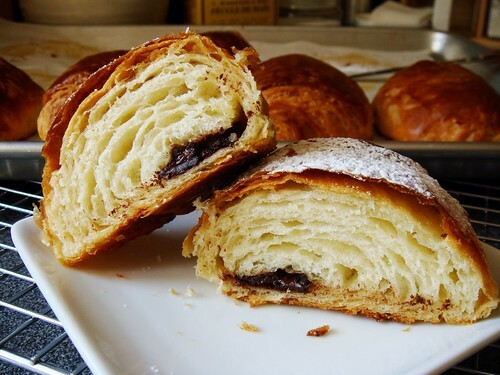 I reserved one third of the dough to make pains au chocolat (aka chocolatine). Shaping was a lot simpler. I just needed to roll squares of dough like jellyroll with a handful of couverture chocolate pieces inside. How I wish I have some chocolate batons at home! By the time I got to proofing and baking, my house was starting to get warm from the afternoon sun. The timing worked in my favour because that was exactly when I wanted the dough to be warm enough to rise. I was on pins and needles while they baked. It was the moment of truth. Did I mess up the layers? Would the butter leak? 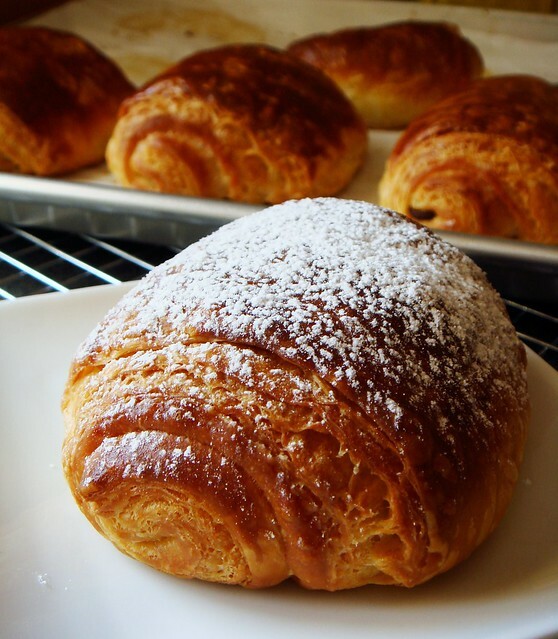 Would my croissants be light and flaky? I waited exactly 15 minutes after the first batch came out of the oven before tearing into one. 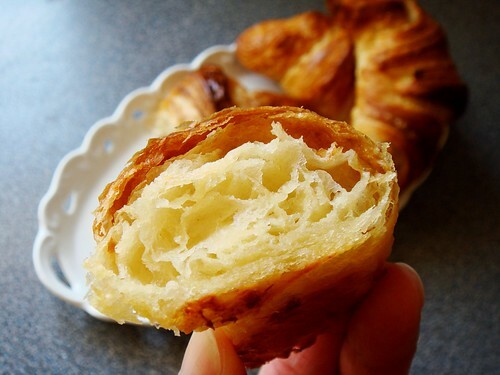 The crispy outside shattered to reveal layers upon buttery layers of soft yeasty bread. It was exactly how I like my croissant. As for the pains au chocolat, I wasn’t too happy with how the chocolate pieces sunk near the bottom. It would be so much nicer if I used chocolate batons instead. Next time! 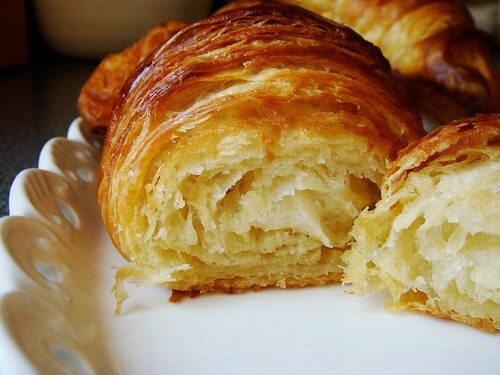 Making croissants at home may not be the most practical use of my time but the satisfaction that I conquered this difficult pastry is hard to beat. 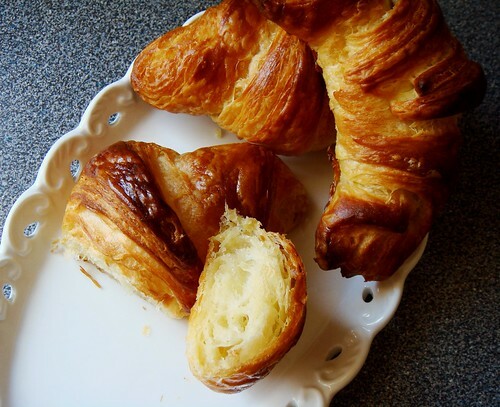 With the success of my homemade all-butter croissants, my confidence to tackle kouign amann is renewed. My obsession with those flaky layers continues.